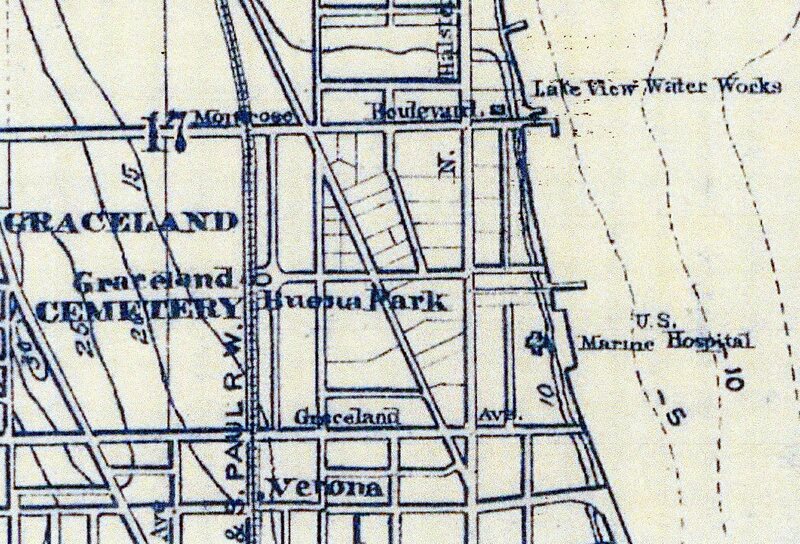 Early settlers in both in Chicago and the north townships of Jefferson and Lake View obtained their drinking water from the Chicago River. 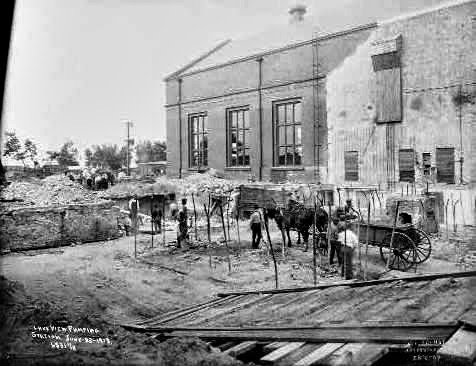 Having no infrastructure yet in place, the early settlers simply carried water home in buckets or had water delivered by private vendors. 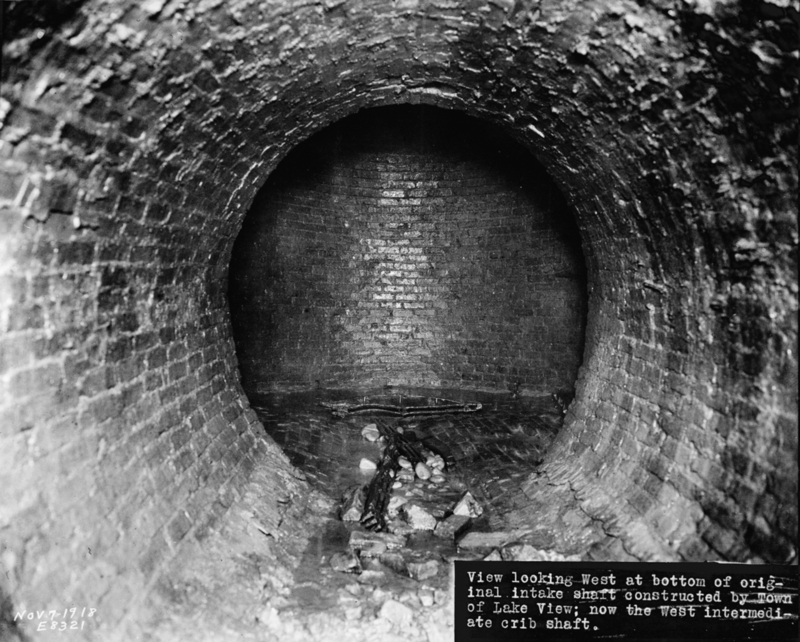 However, the lack of an adequate sewer system at the time led to increased and unchecked pollution of the area's water supplies. 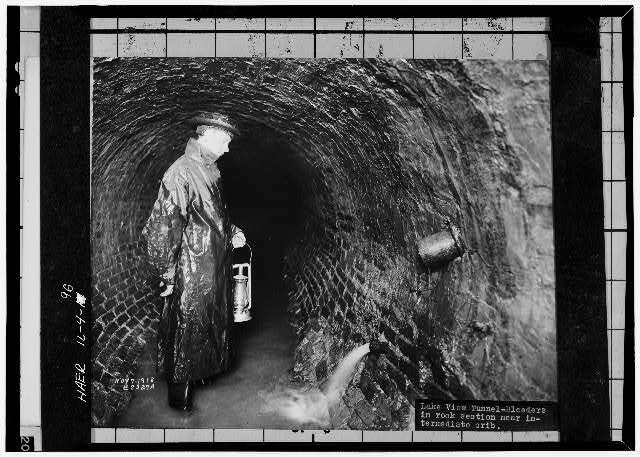 Outbreaks of cholera began a problem. 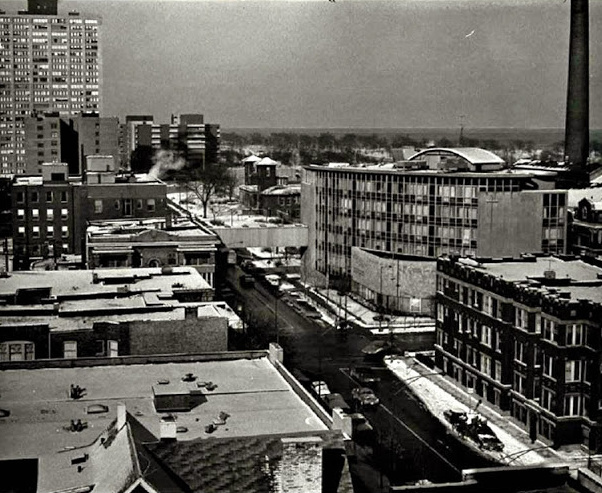 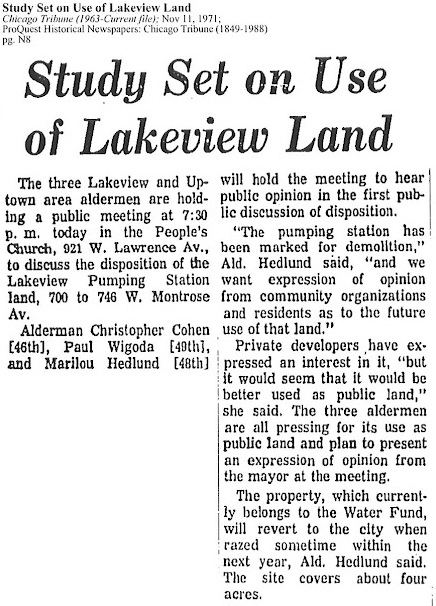 Both Township of Lake View and the City of Chicago administrators created a better plan. Both created off shore facilities to pump water from the lake to the mainland as well as reversing the flow of the Chicago River. 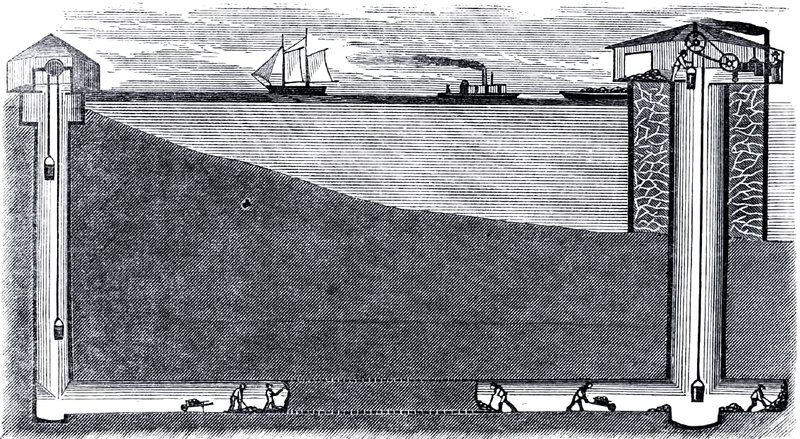 These off shore facilities were connected by a tunnel system to the mainland to be delivered by a pumping station. 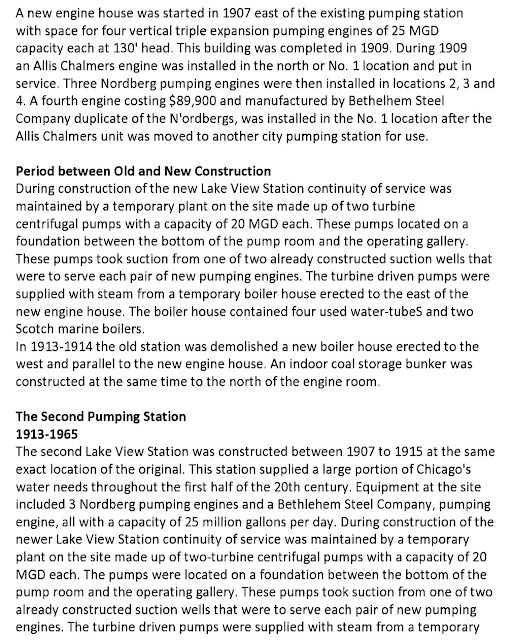 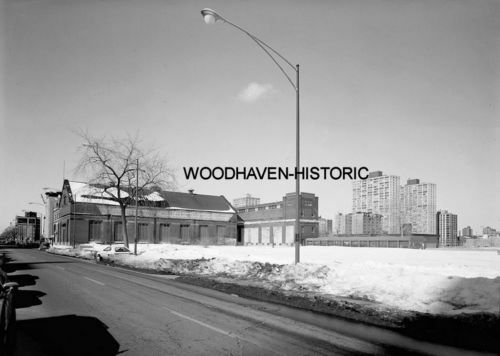 One of these pumping stations was located in Lake View Township on the corner of Clarendon and Montrose avenues. 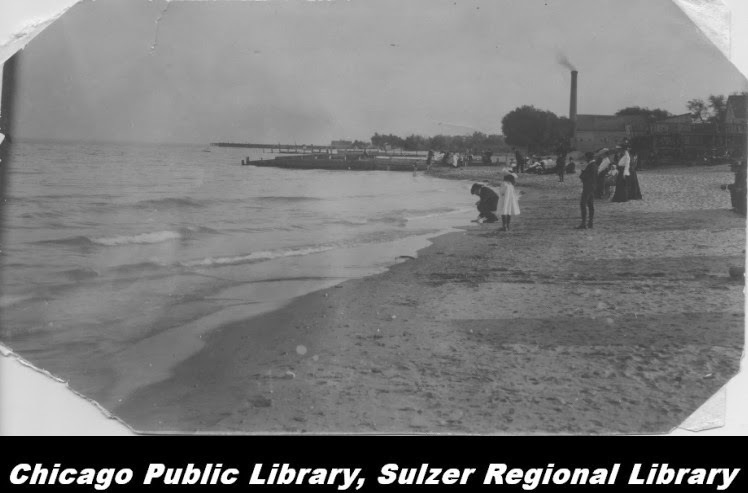 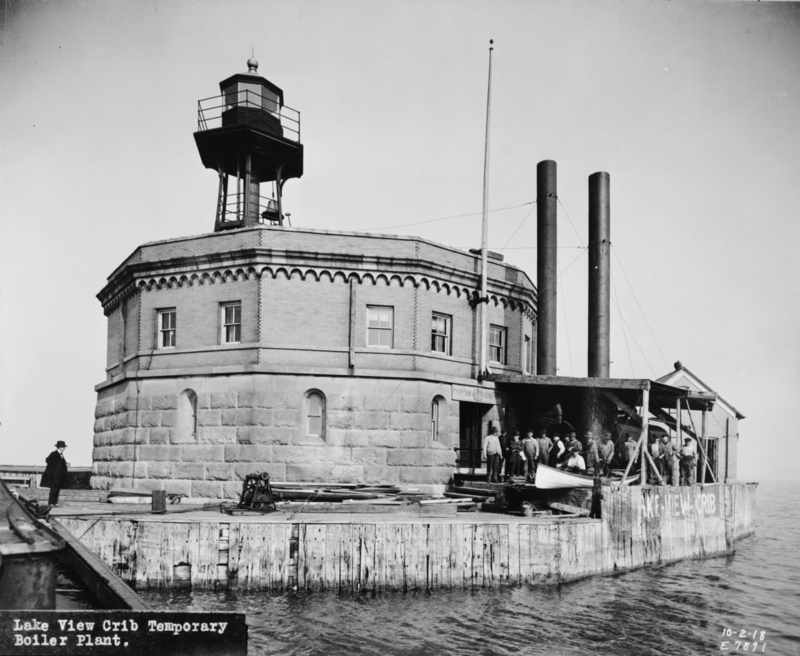 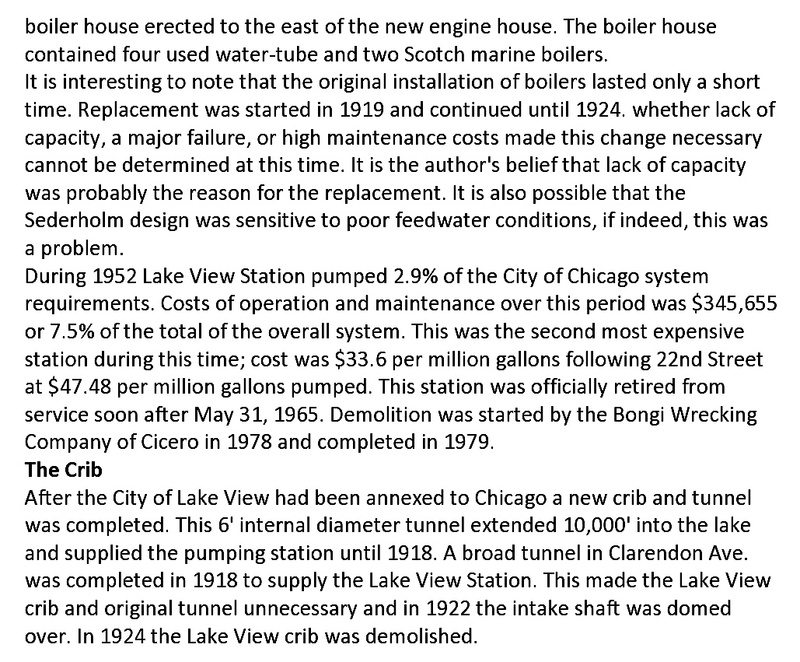 According to a 1900 annual report by the Chicago Public Works Department 44 million gallons for lake water traveled the pumping station within a 24 hour time period. 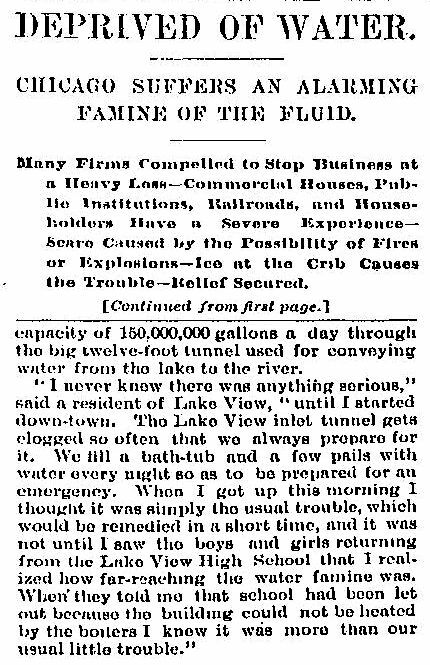 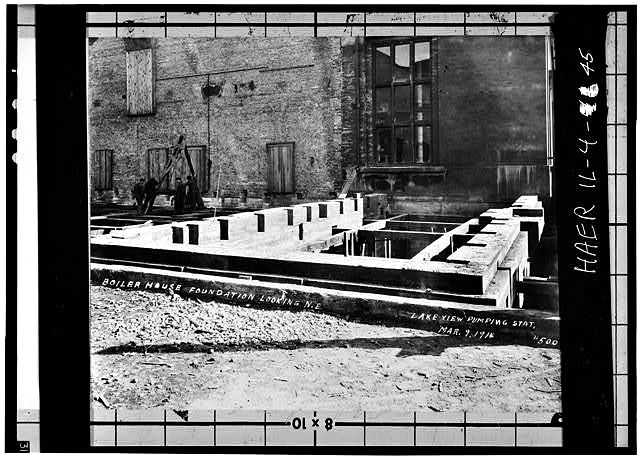 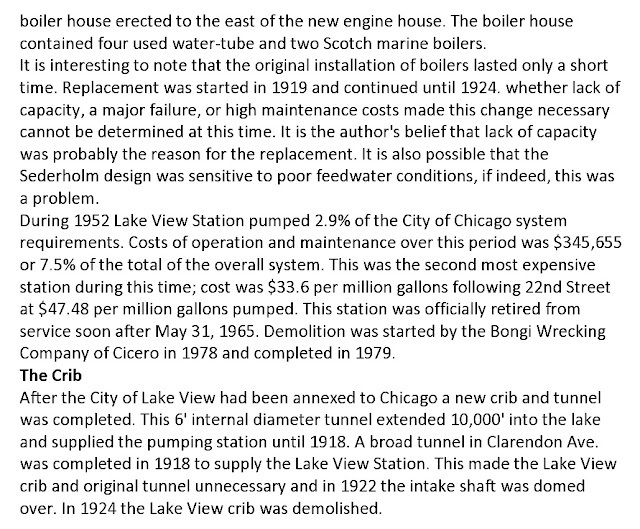 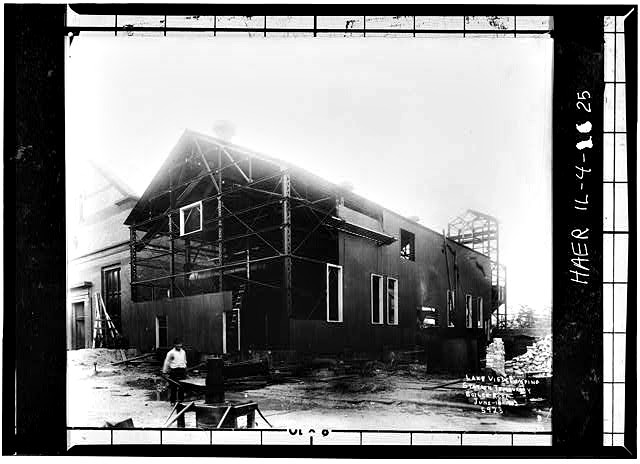 Maintaining the new water treatment facilities became to expensive for the citizens of the township and after the annexation of Lake View and Jefferson Townships in 1889 the City of Chicago became stewards of both the pumping station(s) and the intake crib but without apparent input for the new Chicago aldermen of the area. 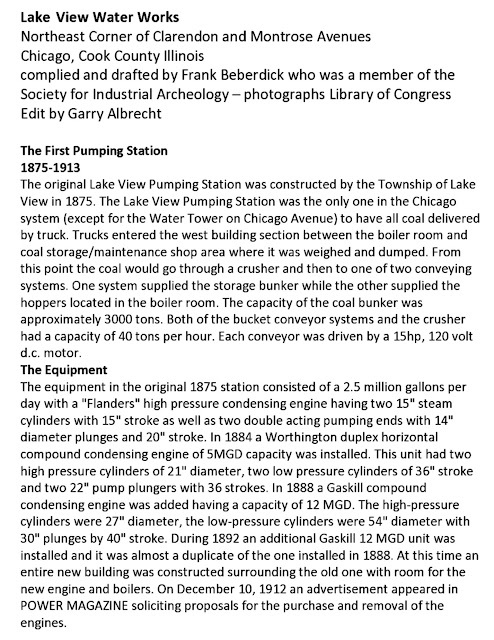 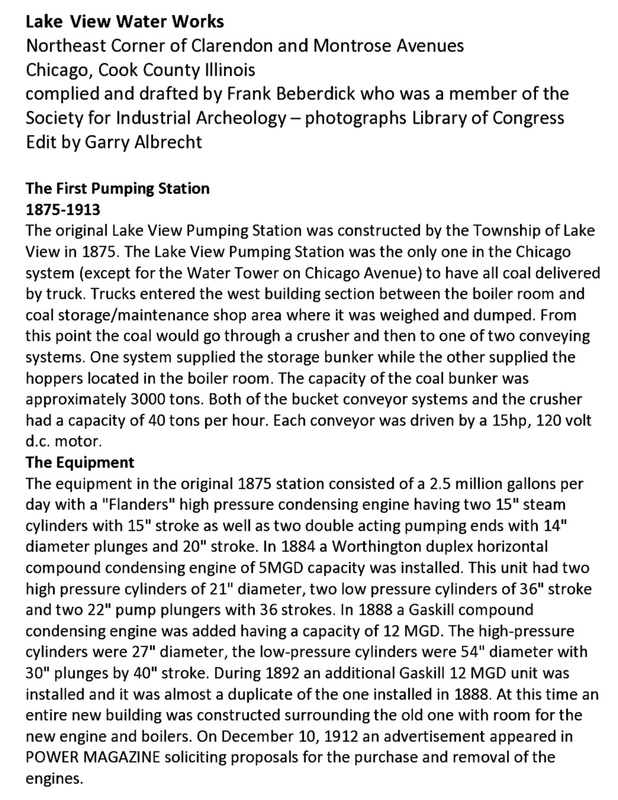 Lake View's first pumping station was authorized for construction by the township in 1875. 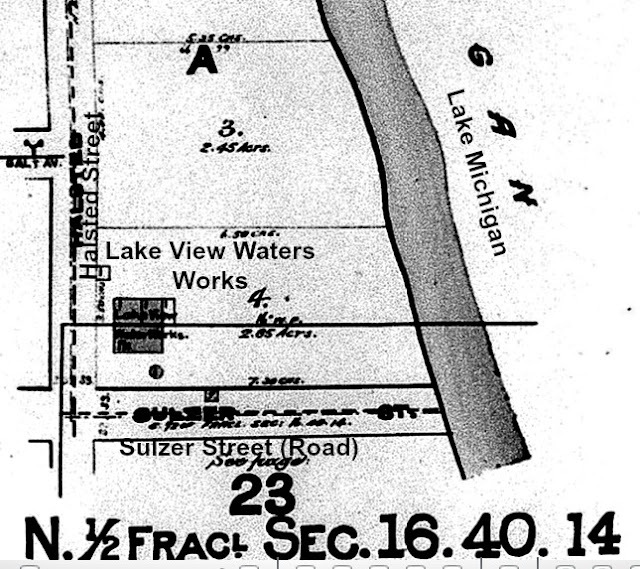 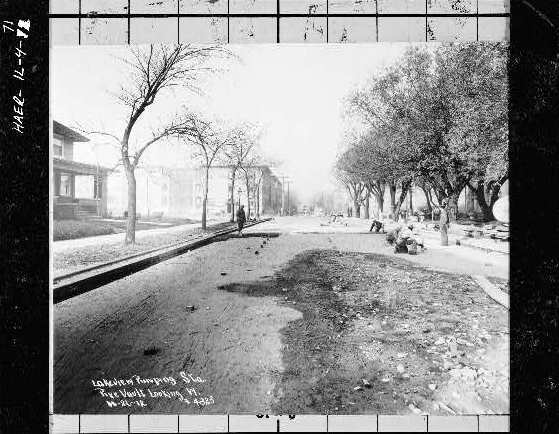 The second station was constructed just south of the original by 1915 when the area was then referred to as the District of Lake View. 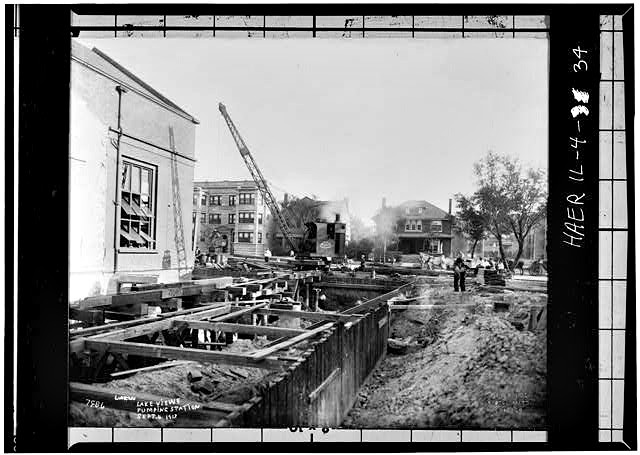 Both stations were located on Clarendon & Montrose Avenues. 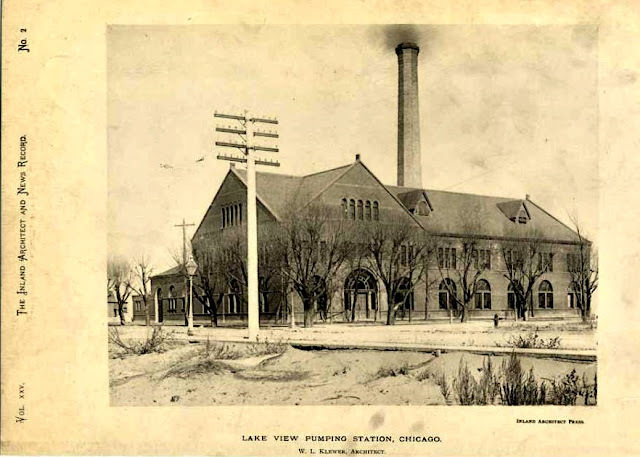 The station supplied a large portion of Chicago's water needs throughout the first half of the 20th century. 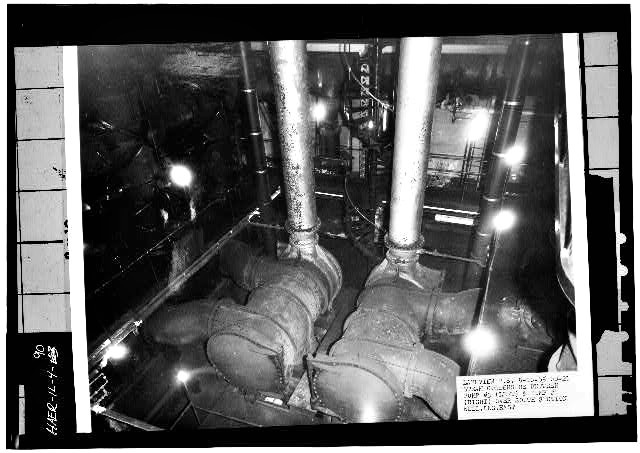 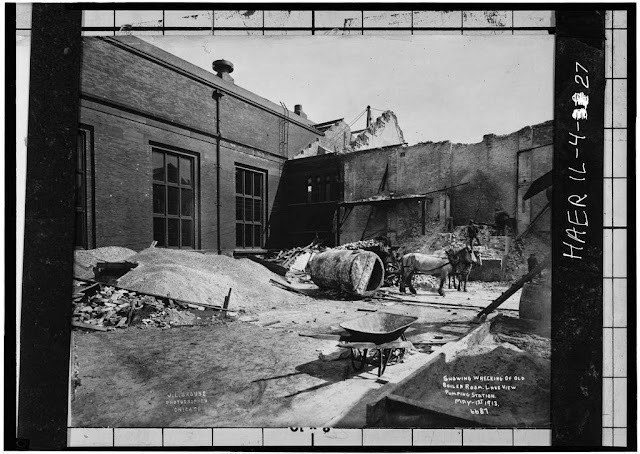 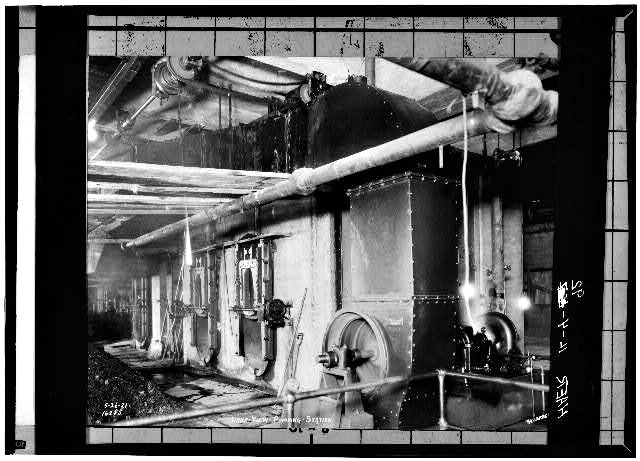 The equipment at the second site included three Nordberg pumping engines & a Bethlehem Steel Company pumping engine, all with a capacity of pumping 25 million gallons per day. 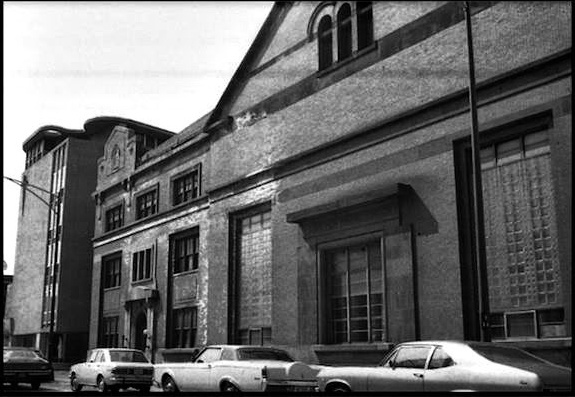 The second & last station, abandon for decades, was demolished in 1979. 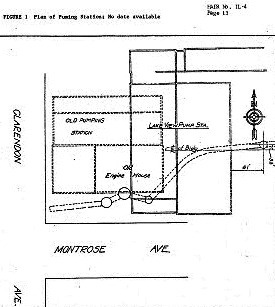 This 1928 Sanborn Fire Map shows not only pumping station but also the Clarendon Public Bathing Beach facility along the Clarendon Avenue - the post popular beach location on the north-side at the time. 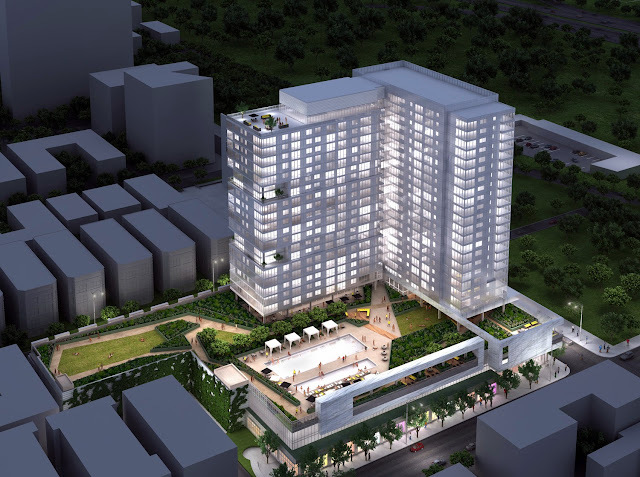 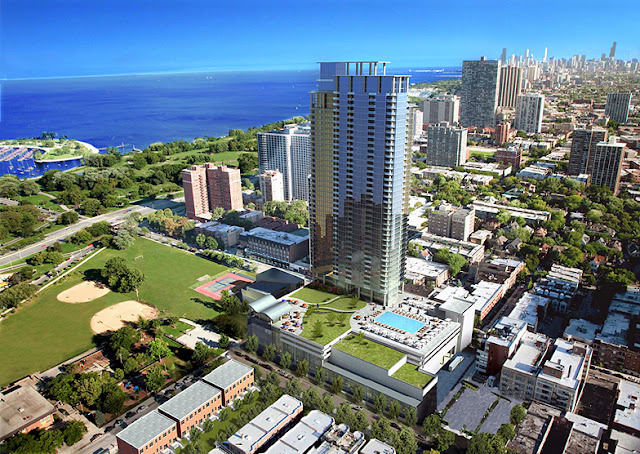 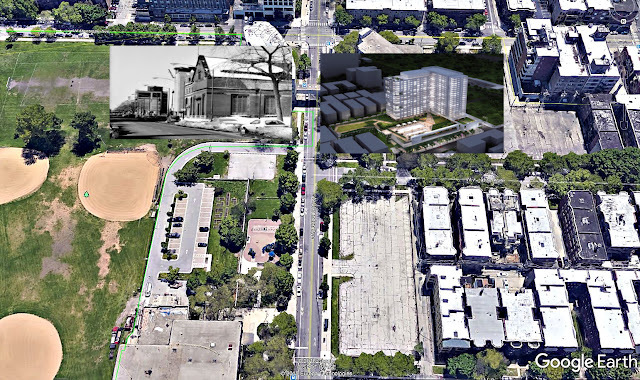 The general scope of the planned development was a major concern to neighborhood associations & block clubs that had traffic concerns due to this massive project like this one. 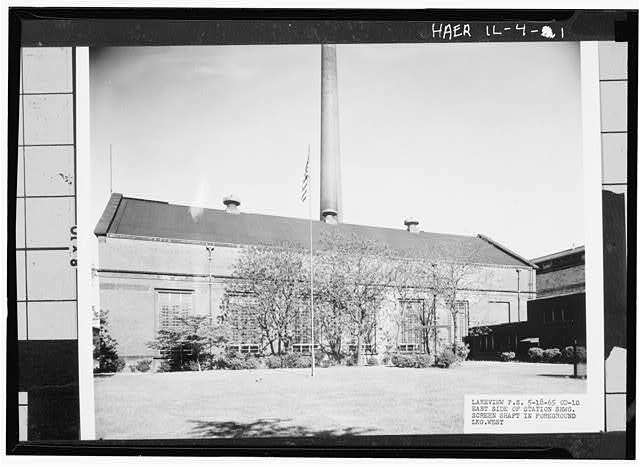 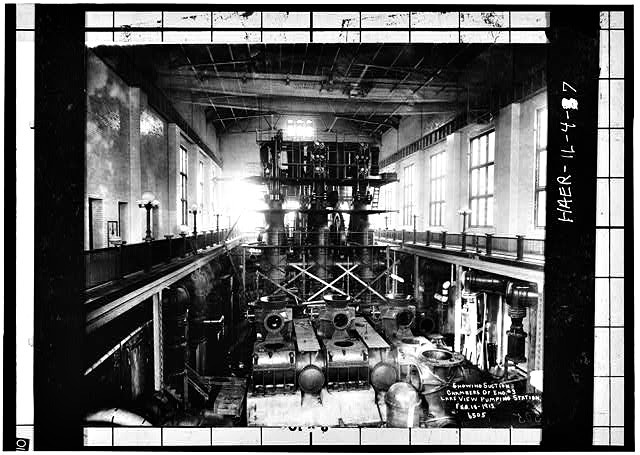 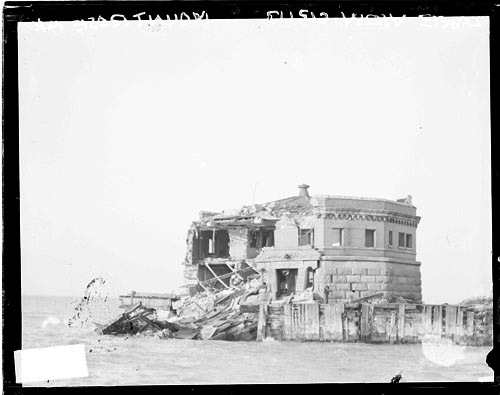 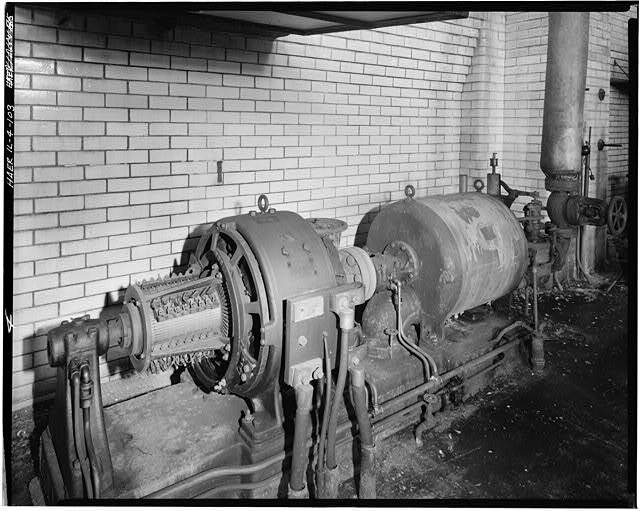 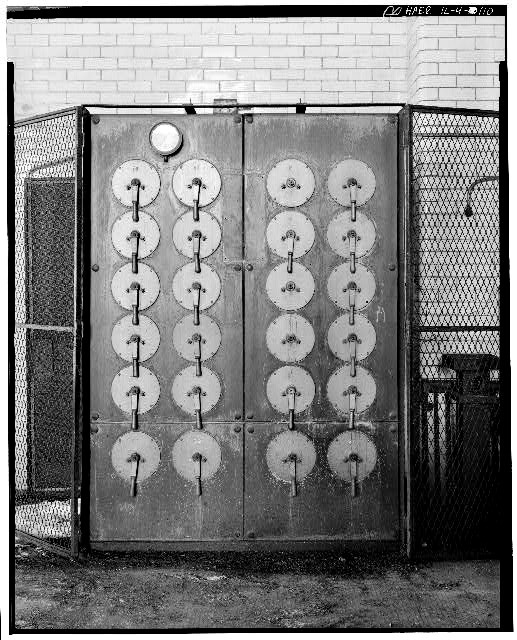 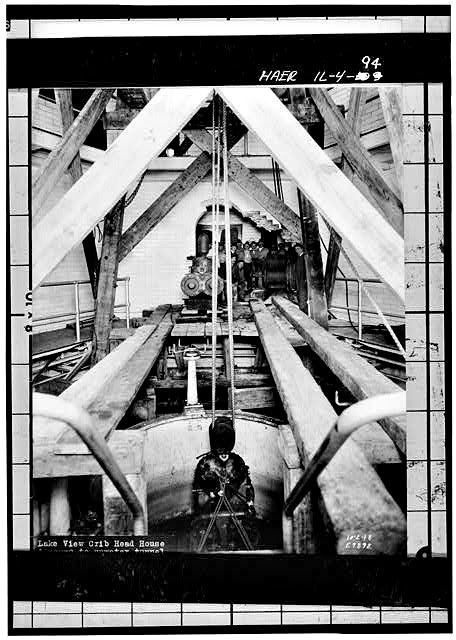 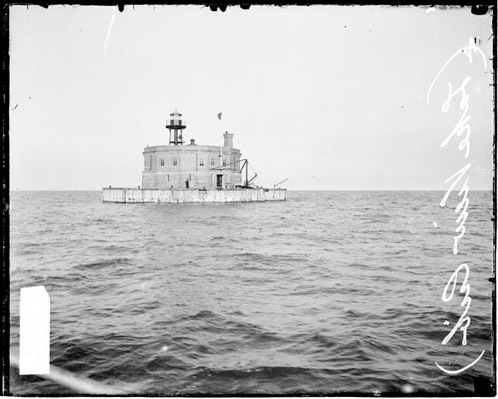 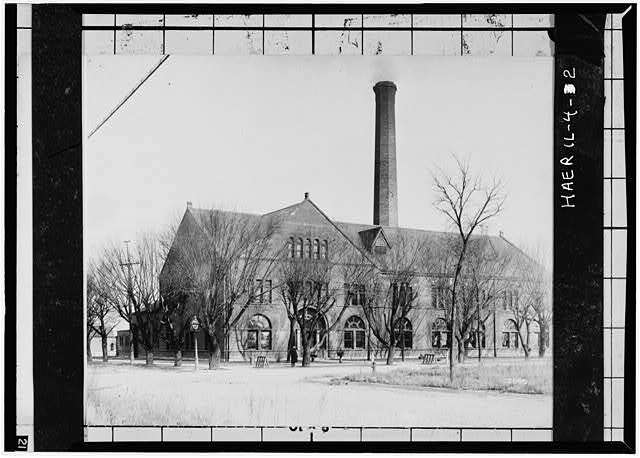 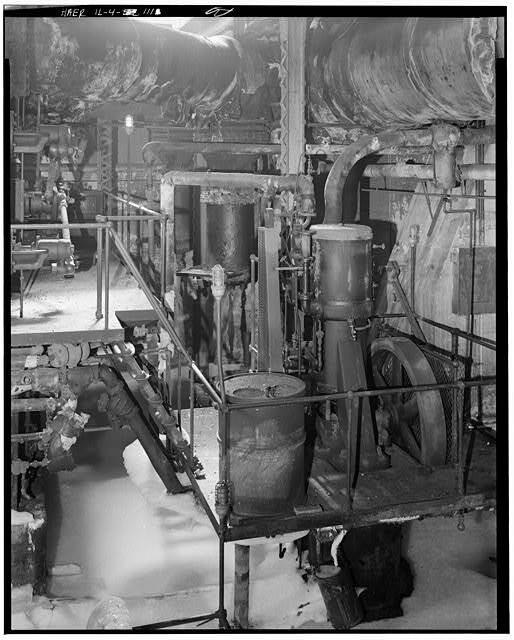 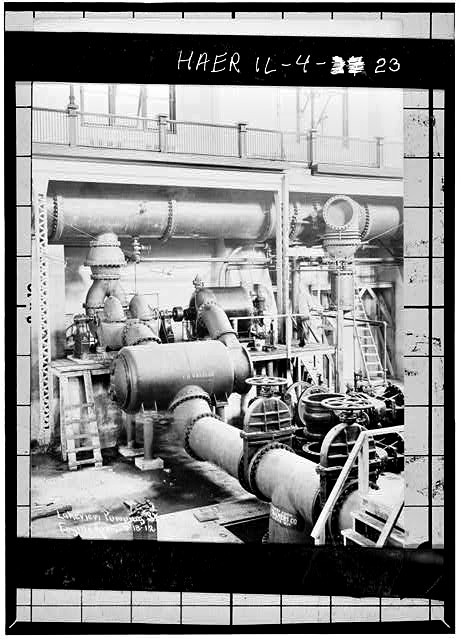 View more photos of the Lake View Pumping Station via The Library of Congress. 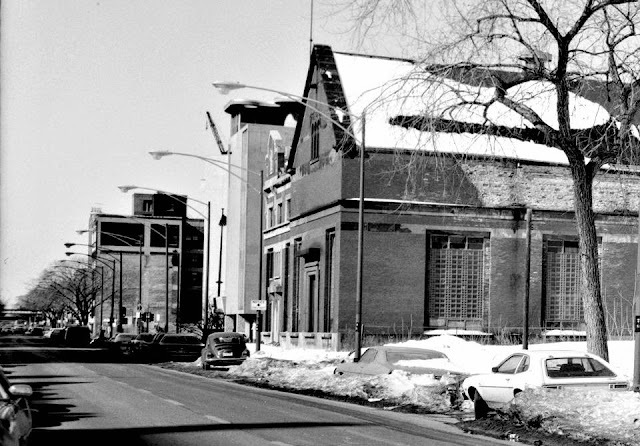 Read about the existing Cribs in Chicago from this 2000 article and this article.